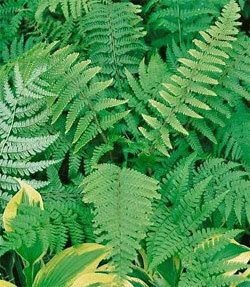 This vigorous and evergreen fern has sturdy fronds that are used in the florist trade. It grows to 2 feet, with deep green, strong fronds that are quite durable. Unlike most ferns this can tolerate quite a bit of drought. Each year the handsome clumps increase in size. Ferns prefer shade with indirect sunlight and high humidity. Moist, well-drained soil.